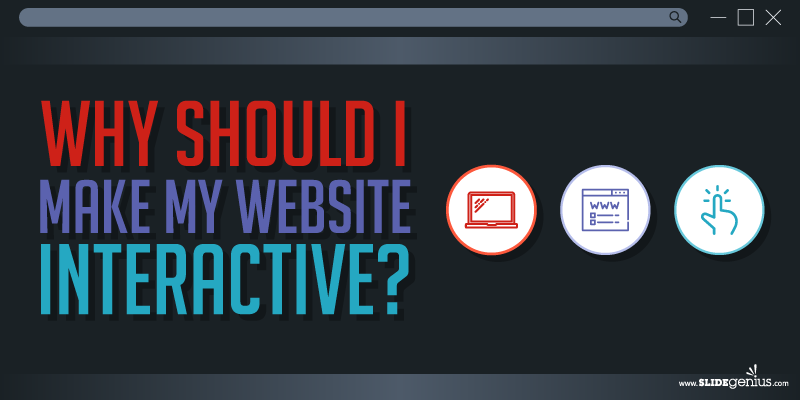 Why Should I Make My Website Interactive? Let’s face it: designing a website is hard. No matter which program or language you use, it’s tedious. You won’t get it in one shot. Everything is a great exercise of trial and error. There will be glitches, misalignments, broken links, elements, etc., to fix. Getting the right sizes for your texts and images will consume many hours as well. In short, web design is a tricky business. It’s such a waste of time and effort when a page is unappealing at best, downright useless at worst. Sure, there are those that are visually appealing, but it only goes to that level—no bigger meaning or purpose, with a shallow understanding and execution of the message. Then there’s the reverse of that: a site that’s rather plain but doesn’t pull its punches, a site that’s direct to the point about its message and purpose. A good example is Google. Its predominantly white theme turns all the focus on what’s in the middle: a colorful and powerful logo with a text field below and two buttons under, “Google Search” and “I’m Feeling Lucky.” Right then and there, you know it’s a search engine at its core. But on August 30, 1998, Larry Page and Sergey Brin started Doodles, which were static for the most part until Dennis Hwang took over; it has since become interactive. People loved the concept and have been looking forward to ones they can play with. Another example is a YouTube feature that lets you play the classic game Snake while your video is buffering. Even Google Chrome makes use of interactivity when a user loses Internet connection, through the simple run-and-jump game with a dinosaur. Given all those interactivity, you’d think that you should make your websites interactive as well, don’t you? It’s a good start, especially when you’re building and looking to impress your base audience. But what’s in it for you? Check the following infographic from SlideGenius to know why interactive pages are worth it.